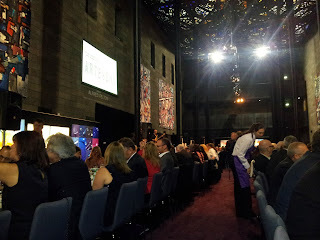 The Jewish Museum of Australia's Artevent was a roaring success last night. Held in the magnificent NGV forecourt and Great Hall works by 28 of Australia's leading contemporary artists were auctioned for a good cause. After numerous bidders getting in on the action Chonggang Du's Newspaper #3 was eventually sold to a very happy couple.